Heat oven to 350°F. 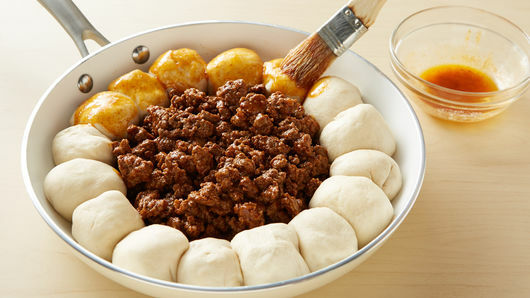 In 12-inch ovenproof skillet, cook beef over medium-high heat 5 to 7 minutes, stirring frequently, until brown; drain. In small bowl, place 1/2 teaspoon of the taco seasoning mix; set aside. Add remaining seasoning mix and water to skillet. Heat to boiling. Reduce heat; simmer uncovered 3 to 5 minutes, stirring frequently, until mixture has thickened and liquid has reduced. Pour into medium bowl. Carefully wipe out skillet. Spray with cooking spray. Separate dough into 8 biscuits. Separate each biscuit into 2 rounds. Cut each cheese stick into 4 equal pieces. Place 2 pieces of cheese on center of each biscuit round. 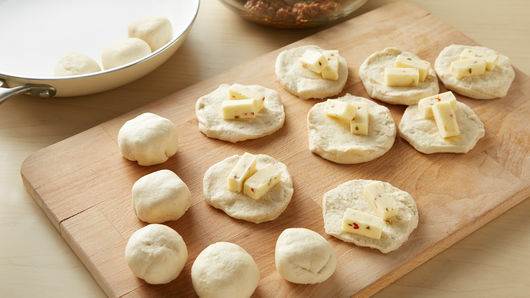 Fold edges up and over cheese; pinch firmly to seal; roll into a ball. Place around edge of skillet with pinched end facing down. Pour beef mixture into center of skillet. To small bowl with 1/2 teaspoon seasoning mix, add melted butter; blend. Brush biscuits with butter mixture. Bake 23 to 27 minutes or until biscuits are cooked through and deep golden brown on top. In large microwavable bowl, microwave Velveeta™ cheese and 1 cup salsa uncovered on High 3 to 4 minutes, stirring every 60 seconds, until smooth. 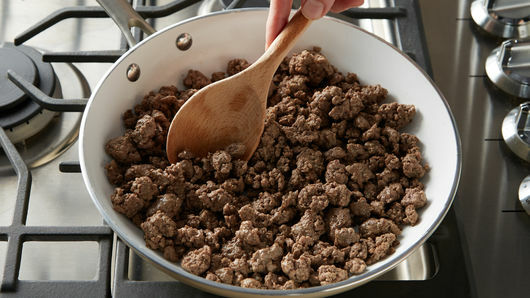 Pour over beef mixture in skillet. Bake 5 minutes. Let stand 5 minutes. Serve with remaining ingredients as toppings. 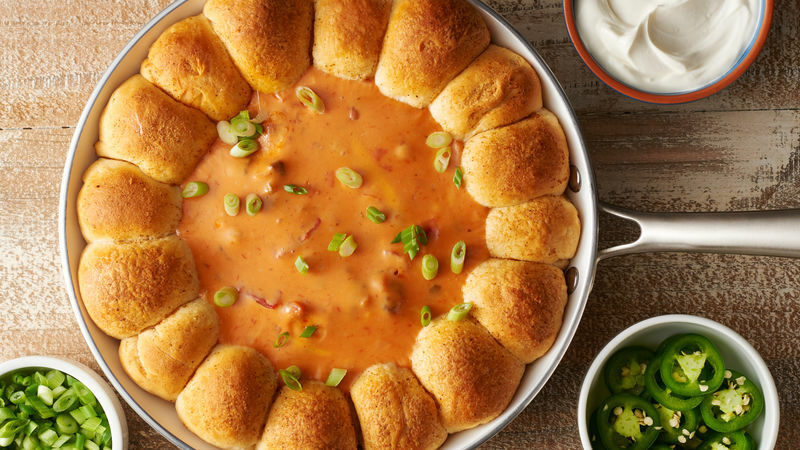 Serve with tortilla chips to scoop up any remaining dip. Adding 1 to 2 teaspoons diced jalapeño chiles to your filling will give your taco meat a nice spicy kick.